Although bluegrass is not exactly my first love, I am no stranger to it. As a teenager, I once sat on the stage with the great Lester Flatt and Earl Scruggs, mainly to avoid the ire of some unruly patrons at a bluegrass festival. My life temporarily spared, I was soon dazzled by their amazing picking. Years later I found myself mixing the likes of Washington, D.C.'s famed Seldom Scene, the wonderful Del McCoury band, and Pete Seeger among others. So it should come as no surprise that I have found yet another wonderful band to enjoy. 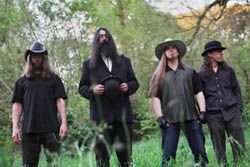 The purveyors of "Uncut Southern Horrorbilly", The Pine Box Boys are San Francisco's latest addition to the bluegrass tradition, albeit a hilariously macabre one. Led by Lester T. Raww, the Pine Box Boys are one funny, stopmin' good time! My first introduction to the "Boys" was at the CD release party for their latest recording, "Arkansas Killing Time", at the Parkside in Potrero. Packed to capacity, their show was a lively and raucous affair, complete with a "woman in a coffin", made out of a giant quesadilla! Founded by Arkansan-in-exile Lester T. Raww (also known for his work in Reagan's Polyp), the band is made up of members of such diverse San Francisco acts as Riptopolis, Salvation Air Force, and Kill The Robots, "their music is a blend of Americana and bluegrass, often with dark overtones, often with up-tempo insincerity." "Arkansas Killing Time" (Trash Fish Entertainment Corp.), is a sort-of musical rogue's gallery celebrating these killers and their acts. Although the songs have clearly been "dragged, like a bloody sack, through some very tall bluegrass", they are unmistakably original. At once repellent and enticing, some of the horrors are titled, "Just A Crush," "I Had To Cut Her," and "Beauty In Her Face". The Pine Box Boys are rounded out by Alex "Possum" Carvidi on banjo, vocals; Col. Timothy Leather on bass; and S. "Your Uncle" Dodds on drums and washboard. Lester told me last weekend, that the boys are preparing for an east coast tour and some shows in Europe. The Pine Box Boys are a truly great bluegrass band with a murderous twist of black humor and down home fun. As Mr. Preston always says, "Don't miss this!"... And please, don't let Granny drive her '56 Chevy on the mountain!